NSP Games - Free games and game downloads for your computer from NSP Games. MatchBlox 2: Abram's Quest is now available! 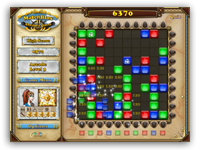 Match colored blox to solve puzzles and collect items that will unlock Captain Abram's secrets in this addictive brain bender. Download the free trial and try it today! Play these games in your browser now! Download these free full games to play any time on your computer!